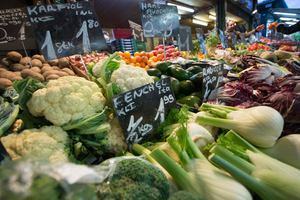 Can human beings agree on a universally accepted definition of our shared values? If we can’t agree, would humanity be enriched because the diversity of ways of life and thought would be maintained? Would this enrichment be sufficient for the different societies to get along in a “pluriversal” world? Or, on the contrary, would there be an increasing number of conflicts, with the differences becoming gaping divides between societies? Wouldn’t one or more major power be tempted to impose their conception of what is, in their view, “universal”? And that’s not all: knowing how to distinguish between what is universal and what is not, requires a list of values and virtues to be recognized as priorities everywhere (for example: freedom, property, loyalty, honesty, solidarity) and to be sure that they really are priorities, which is not an easy task. Wherever you are and whatever the era, certain values are at the heart of societies, starting with: freedom and rights: (the “imprescriptible rights” of human beings: equality, including freedom of gender; public freedoms, including freedom of religion, the right to happiness, including self-fulfilment). But humans also have duties: civic duties, self-sacrifice, respect for others, respect for life and national unity. The universality of these values can be deduced from the careful reading of the Declarations of Human Rights: these values were even considered universal in ancient times. 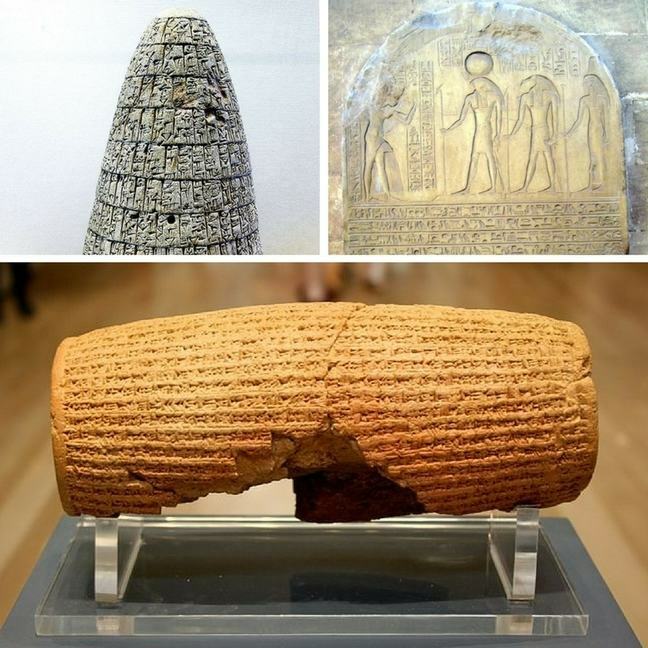 Examples include the Sumerian Urukagina reforms (45 centuries ago), Horemheb’s Egyptian edict (34 centuries ago) and the philosophical principles of the Persian Cyrus (27 centuries ago). Clockwise: Urukagina’s code, Mesopotamia. Horemheb stela, 18th dynasty, Egypt. The Cyrus Cylinder, Persia, 539–530 BCE. Photographs by: unknown, Neithsabes, and Mike Peel, used under Cc licence. Brahmi inscription on a fragment of the 6th Pillar of Ashoka. Photograph by PHGCOM, used under Cc licence. 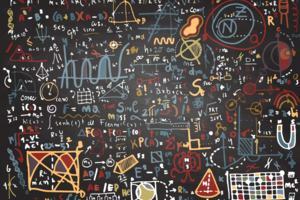 What is the bottom line of all these ancient texts? First, the principle of justice is presented as meaning both “truth” and “fairness” (in other words, what is mathematically just, meaning exact, is socially just too, meaning equitable); and anything arbitrary is forbidden. Second, they promote tolerance of different beliefs. Thirdly, universal self-discipline, of citizens and rulers alike, does not authorize the latter to exploit the former. Fourth, respect for others, meaning not doing to others what you would not have done to you. But there is also what has not been found in them, at least not yet: the right to not believe; individual and not only collective freedom; and the people’s sovereignty, not only divine sovereignty. It should be noted that the English, the first Western authors of a declaration of rights which was deemed a real turning point, were not alone in inventing a list of universal values. 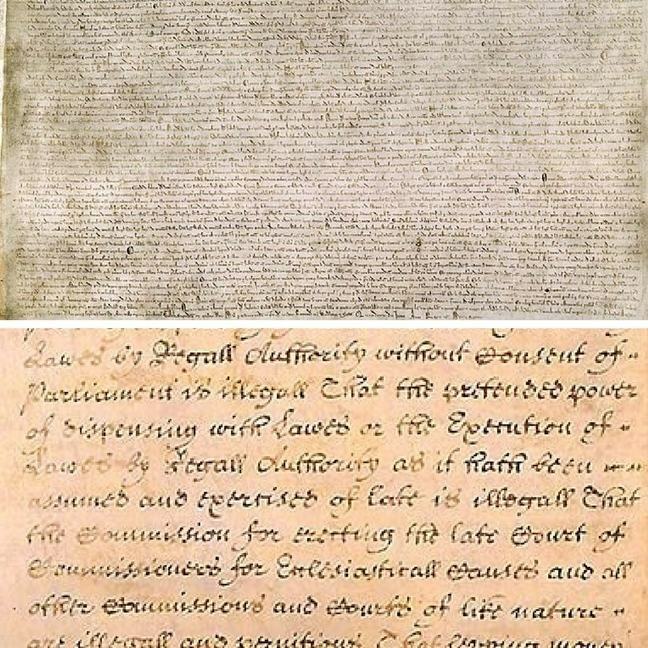 Top: a detail of the Magna Carta (originally known as the Charter of Liberties) of 1215. Bottom: a closeup of the middle portion of the English Bill of Rights of 1689. Public domain. Here are Declarations of Rights which are also said to be universal: those written during the other two 18th century revolutions. 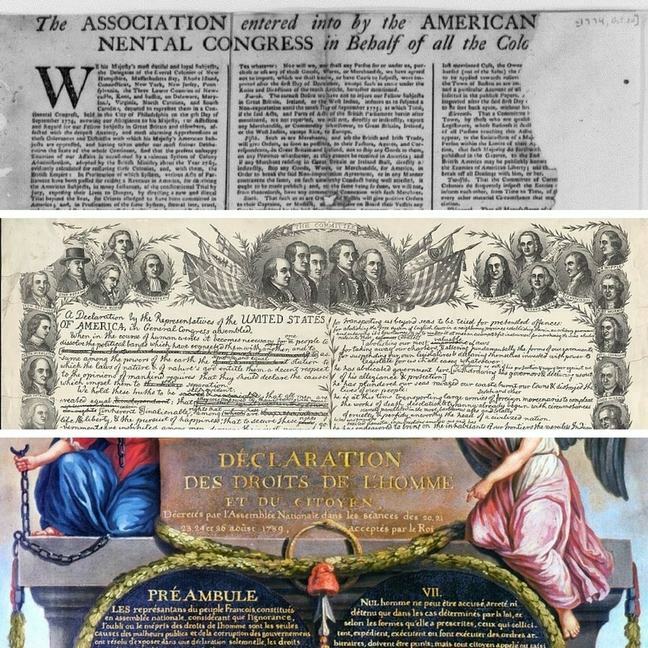 Top: The Continental Association, signed by Thomas Jefferson, 1774. Middle: the United States Declaration of Independence, 1776. 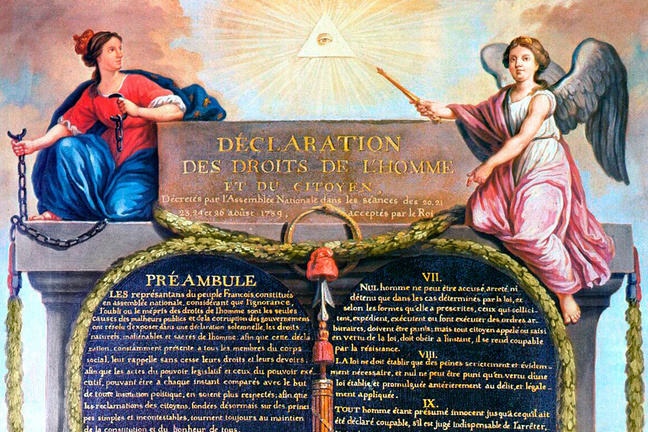 Bottom: the Declaration of the Rights of Man and of the Citizen, France, 1789. Public domain. “That to secure these rights, Governments are instituted among Men, deriving their just powers from the consent of the governed, That whenever any Form of Government becomes destructive of these ends, it is the Right of the People to alter or to abolish it, and to institute new Government, laying its foundation on such principles and organizing its powers in such form, as to them shall seem most likely to effect their Safety and Happiness”. The French revolutionaries simplified this basic principle: according to them, all men are born free and equal “in law” (even though they are not equally endowed by nature). But are these values really applied in real life? To answer this question, we will now turn to a series of maps focusing on some interesting indicators: gender equality, the death penalty, public freedoms and freedom of information, the capacity for self-fulfilment relying on reason and not just on belief. 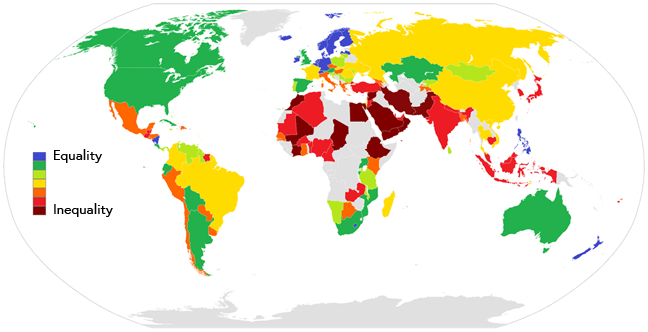 Let’s start with gender equality (the blue and green countries are egalitarian, the red and brown countries are not). Gender Gap in the world (2012). Author unknown, used under CC licence. There are two other ways of assessing gender equality (on the left, the masculinity rate, in blue; oppression of women on the right). Left: Masculinity rate (by Nay.T.Diniz, used under CC licence). Right: Discrepant Government Behavior Concerning Women(by the WomanStats Project, used under CC licence). Let’s now consider another indicator of respect for the human person: the death penalty (in dark green, it has been abolished; in light green, it is used for war crimes only; in brown it is legal but not used; in red, it is used without conditions). Capital punishment in the world. Author: Kamalthebest used under CC licence. Source Amnesty International. Political rights and civil liberties. Author: the Freedom House, used under CC licence. Press Freedom Rankings Map (2008). Public domain. So, do national values reflect real enthusiasm for the same values everywhere? 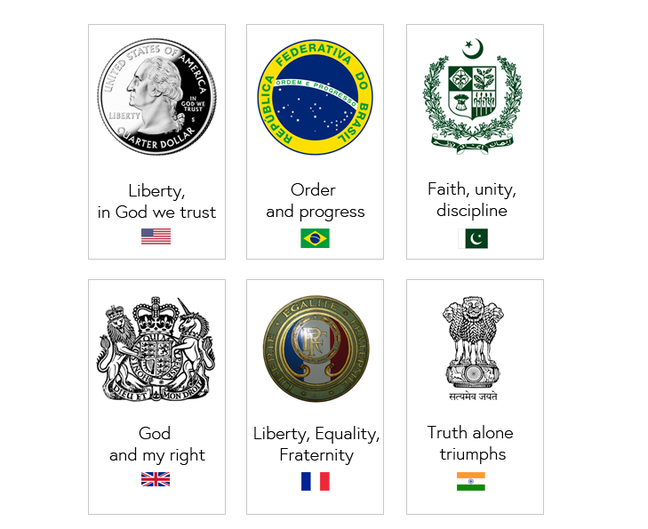 Just looking at the motto or emblem of each country, you see that national priorities differ considerably (duties, such as faith and order, are often opposed to rights). 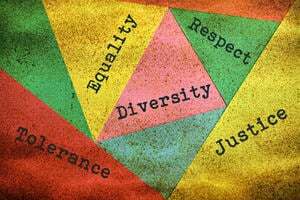 Universal values do exist, and have been invented all over the world, and very early in history. They balance rights and duties, individual and collective freedoms, in order to protect people and peoples from arbitrary decisions. Humanity therefore shares these universal values, which brings together all its constituent nations.